This month's challenge is to a create a project with a Birthday theme! You have TWO WEEKS to play along - Deadline to enter is Friday, July 10th, 2015 at Midnight CST. The winners will be announced on the NND blog on Monday, July 13th. Create a NEW project (card or other paper craft item). Your project MUST use at least one Newton's Nook Designs stamped image (or free digital stamp - check out our Freebies page). Post your project to your blog or to an online photo gallery such as Flickr, Pinterest, or splitcoaststampers (on splitcoast please use keywords newtonsnook and IPC22). TIP: Please make sure your photo in focus - We can't pick you as a winner if we can't see your card clearly because your photo is blurry! 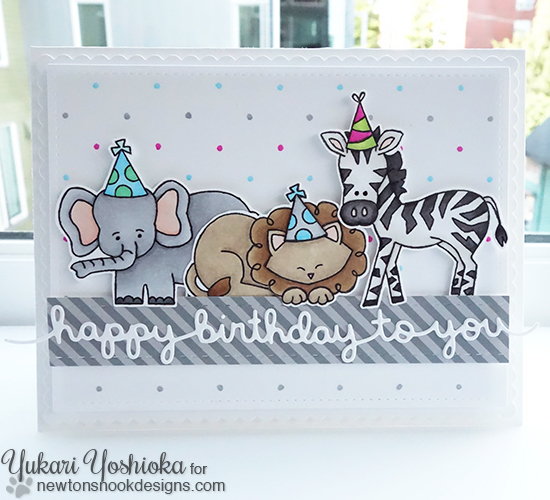 Here's a birthday card by Yuki - she used the cute zoo animals from the Wild About Zoo stamp set and added on birthday hats from the new In Slow Motion stamp set. So adorable! 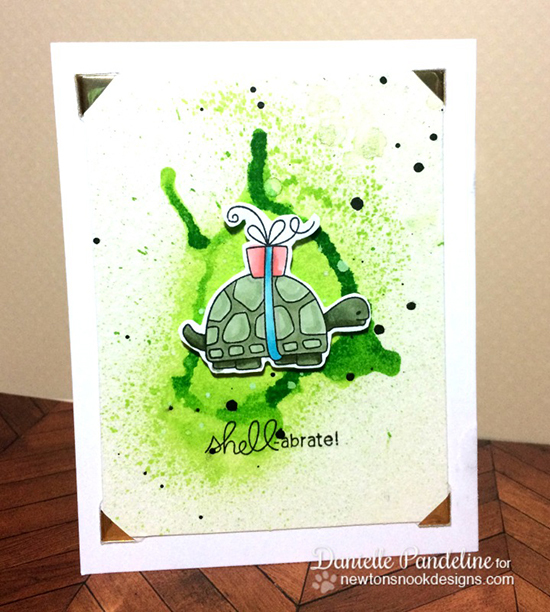 Here's a cute turtle birthday card by Danielle using our new In Slow Motion stamp set. I love the fun paint splatter background. This sweet kitty card by Samantha is so fun! I love the confetti watercolor dots in the background. She used the kitty image with the gift from our Newton's Birthday Bash stamp set and added on the hat from the Fetching Friendship stamp set. 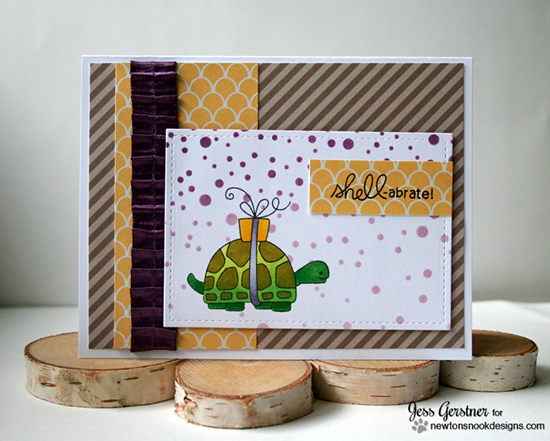 love the purple and yellow color combo and the fun dot background! 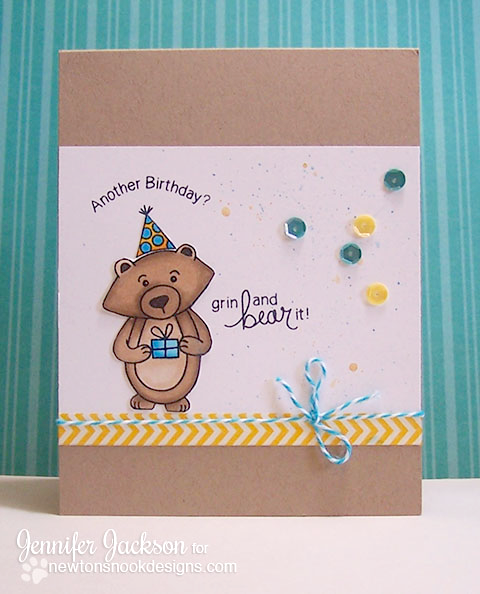 Here's a birthday card by me - I used Winston's Birthday stamp set to create a fun and simple birthday card! I added some paint splatter and sequins to the background to help add dimension!